The overwhelming thing about Canada is its sheer size. How can one train ride in a single country take three whole days and three whole nights? And you’ve still got further to go. No other mode of transport conveys such an acute sense of Canada’s vastness, of its beautiful, desolate, wide-open spaces. Endless stretches of track take you through a wilderness scarcely touched by man. You can travel for hours without seeing a road or a house, or indeed any sign of habitation – it’s an incredible, almost haunting, experience. Back in 1872 an early traveller wrote a book about Canada’s interior called The Great Lone Land. It captured the North American imagination and became an instant bestseller. Today, much of Canada is still a ‘great lone land’ that continues to fire the imagination of the modern traveller; the huge iron artery stretching across the continent is truly the best way to cross it. 7 November 1885 it paved the way for rapid expansion, mass immigration and economic boom. Urban development ran parallel to the tracks and the stops along the line became the backbone of a new nation – which makes a rail trip today a fascinating journey into this young country’s history. What you’ll probably remember about the trip more than anything, though, is the dazzling scenery you travel through. In 1885 the General Manager of the Canadian Pacific Railway Company realized that travellers would flock from all corners of the world to ride through such magnificent landscape. ‘If we cannot export the scenery,’ he declared, ‘we shall have to import the tourists!’ And tourists have quite joyfully been imported ever since. Imagine the snow-capped peaks towering right over the tracks; the sweeping panoramas of lakes, waterfalls and glaciers gliding past you. Better still, imagine looking out of the window onto a jade-green lake to find yourself staring at a moose. The whole thing takes your breath away. 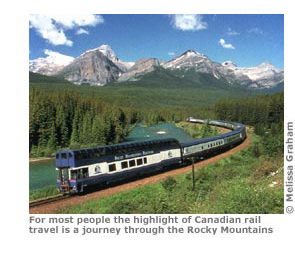 On top of all this, a rail ride across Canada is a supremely relaxing experience, a rare joy in today’s climate of rapid communications and jet-travel. In the words of Robert Louis Stevenson, ‘the train disturbs so little the scenery through which it takes us, that our heart becomes full of the placidity and stillness of the country’. Nowhere is this more true than in Canada.